In the course of my research last month, I kept coming across the names of notable professors who have one thing in common: George Mason University (GMU). There is Frank Buckley, a law professor and speechwriter; political columnist and economist Walter Williams; Nobel Prize-winning economists James Buchanan and Vernon Smith; and economics professors Tyler Cowen and Alex Tabarrok, founders of Marginal Revolution University (an online library of free economics education videos). Obviously if you want to excel in economics, GMU is the school for you! If you are Muslim or Jewish or Christian, you belong at Mason. If you grew up in Mexico City, Islamabad, or Roanoke, you belong at Mason. If you are part of the LGBT community, you belong at Mason. If you are Black or Brown or White, you belong at Mason. If you voted for Clinton or for Trump or anyone else, you belong at Mason. According to the Office of Admissions, “[Homeschool] students will be reviewed no differently than those who apply from traditional high schools, and there are no special additional requirements that must be met for consideration.” But they will still need to have completed the minimum preparatory coursework required for admission, provide a transcript of some kind, and submit a recommendation letter from someone outside the immediate family who can attest to their academic achievements and abilities. 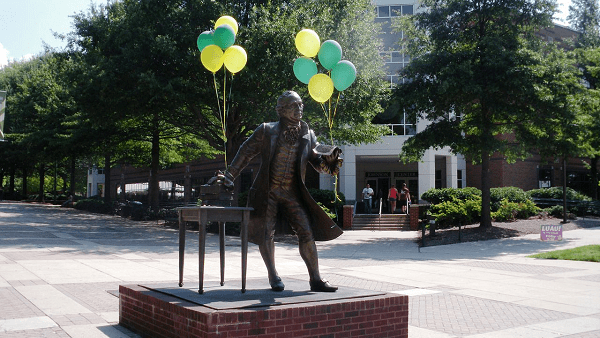 George Mason University was named after George Mason, a great patriot and one of the founding fathers of the United States. He served as Justice of the Virginia County Court, delegate to the U.S. Constitutional Convention, and was home educated himself (mainly by tutors). A bronze statue of Mr. Mason stands in front of the Johnson Center on the main campus. The 7½ foot statue shows Mason presenting his first draft of the Virginia Declaration of Rights, which became the model for the U.S. Constitution’s Bill of Rights. Posing for a photo with George is considered a “must-do” for GMU students. George Mason University was founded as a branch of the University of Virginia in 1957 and became an independent college in 1972. The institution is now the largest public research university in the Commonwealth of Virginia, with four U.S. campuses: Fairfax, Arlington, Prince William, and Loudoun County. The university also has a campus in Songdo, Korea, where U.S. students are permitted to spend one or two semesters. GMU’s colleges and schools include: Antonin Scalia Law School, College of Education and Human Development, College of Health and Human Services, College of Humanities and Social Sciences, College of Science, College of Visual and Performing Arts, Schar School of Policy and Government, School for Conflict Analysis and Resolution, School of Business, and Volgenau School of Engineering. GMU offers over 150 majors, minors, concentrations, and certificates. These include all of the usual subjects plus some very specialized ones. You can see them all here: https://www2.gmu.edu/academics. In addition to its internationally-renowned economics faculty, GMU is recognized for its programs in law, creative writing, computer science, business, and biomedical research. GMU is also a Virginia Sea Grant institution. Mason Online offers 30 programs that allow students to take GMU courses while at home, stationed abroad, or traveling. The digital learning curriculum maintains equal academic rigor and integrity to the classroom materials. So the degree is the same as if you took classes on campus, while offering the flexibility to fit your needs. GMU’s online Bachelor of Science in Nursing program is ranked as one of the best in the nation. George Mason University has a 3+3 Accelerated Program that gives highly motivated undergraduate students a fast track to earn both a bachelor’s degree and a law degree in six, rather than seven, years of study. Other accelerated programs of study allow students to obtain their bachelor’s and master’s degree simultaneously in just five years. GMU also offers a variety of study abroad options through its Center for Global Education. Mason Study Abroad manages a variety of international programs in nearly 50 countries: short-term programs during the winter and summer breaks, semester and year-long programs (including faculty-led programs in Florence, Madrid, and at Oxford University), intensive language courses, and international internship opportunities. Admission to the George Mason University Honors College is open to both freshmen and transfer students based on a holistic review of each student’s academic performance, rigor of coursework, standardized test scores, class rank, essay response, teacher recommendations, outstanding leadership, and commitment to community service. Approximately 20 students each year are named University Scholars, Mason’s highest academic distinction, which includes a full tuition scholarship. As “an institution dedicated to research of consequence,” George Mason University is home to numerous research centers and institutes. The research is focused on health, sustainability and security. In health, researchers study wellness, disease prevention, advanced diagnostics, and biomedical analytics. Sustainability research examines climate change, natural disaster forecasting, and risk assessment. GMU’s security experts study domestic and international security as well as cyber security. George Mason University’s main campus is situated on 677 acres of beautiful woodland with a large pond in a suburban part of the City of Fairfax, Virginia. The Fairfax campus is the location of the EagleBank Arena, a 10,000-seat multi-purpose arena and home to the NCAA Division I men’s and women’s basketball teams. GMU was named one of the most diverse public universities in the country by U.S. News & World Report. There are more than 34,000 students of all ages, nationalities, and backgrounds on campus. The student body represents more than 130 countries and all 50 states. At least 6,200 students live on campus, including 75% of the freshmen class. There are 40 different residence hall options (all with free laundry!). GMU hosts over 500 student organizations and thousands of events every year. Many off-campus amenities are within walking distance. The Fairfax County area is filled with great shopping, dining, sightseeing, entertainment, and historical sites. In just a short drive, you can be hiking in the Shenandoah Mountains or walking the boardwalk in either Ocean City, Maryland, or Virginia Beach. GMU is approximately 15 miles outside of Washington, D.C., one of the most important political, economic, and intellectual hubs in the world. Students can enjoy numerous internship, learning, and recreational opportunities that only a world-class setting like D.C. can offer. The nation’s capital is easily accessible by car or public transportation.